A few years ago, Torah teacher and therapist Chani Juravel was shopping for shoes at Marshalls. On one side of the shoe department she noticed a beautiful, regal Chassidic woman. And on the other side she noticed a teenage girl with piercings and a blue mohawk in a torn leather vest. Mrs. Juravel found herself contemplating the contrast between her 2 fellow customers in the shoe department that day. After she left the store, Chani Juravel could not get this incident out of her mind. What struck her was that the Chassidic mother almost certainly felt that people who saw her together with her daughter would judge her negatively for having a daughter who looked like that. But, in fact, the opposite was true. 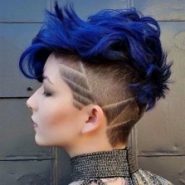 Mrs. Juravel had been blown away by this mother and her loving and accepting response to her daughter– blue mohawk and all. And that, Mrs. Juravel explained, is so often the case. We feel like others look down on us and judge us–for our perceived failings as mothers, as wives, as homemakers, as people–but in fact, in the majority of cases, other people look at us and are amazed how we manage everything so well. In her class this week at the Israel Center, Chani Juravel explained that the word for miracle, Nes, is made up of two Hebrew letters–nun and samech. Our sages teach that nun stands for noflim–people who have fallen. And samech stands for somech–people who are supported. And this, she explained, is one of the greatest miracles of all, the miracles WE create, by changing ourselves from a nun into a samech, from a person who feels like someone who has fallen in life, to a person who knows she is supported by Hashem, as well as those around us. In Marshall’s shoe department, and beyond. LOVE LOVE LOVE this 🙂 Thanks for posting!